What are the indirect taxes that GST has replace? What is the framework that the GST follows? Who are the taxable persons under GST? What happens to mixed supply and composite supply under GST? In this article let us learn some of the GST terms that will be useful for any business, along with throwing insights on GST and its benefits. 1. What is Goods and Services Tax (GST)? GST is a single uniform indirect tax which was introduced to replace Central and State indirect taxes such as VAT, CENVAT, and others. GST applies on all types of businesses, small or large. This makes it one of the greatest tax reforms in the country. The entire nation will follow a unified tax structure. As the name suggests, GST will be applicable on both goods and services and India will follow a dual system of GST to keep both the Centre and State independent of each other. The GST council will be headed by the Union Finance Minister and it will consist of various State Finance Ministers. GST will be devised as a four-tiered tax structure with tax slabs of 5%, 12%, 18%, and 28% for various different categories of products and services. 0% rate is kept for most essential goods such as rice, wheat. 2. What are the indirect taxes that GST has replace? 3. What is the framework that the GST follows? Like other countries such as Canada and Brazil, India will follow the dual form of GST. At the intra-state level, where goods and services are sold within the state, CGST (Central Goods and Services Tax) and SGST (State Goods and Services Tax) will be levied. When selling goods and services into other states (inter-state sales), IGST (Integrated Goods and Services Tax) will be levied. Importing goods will come under IGST as it will be considered as inter-state supply. Imported goods will also attract basic customs duty. Exports and supplies to SEZ, however, will be zero-rated. As mentioned earlier, GST will unify taxation system in the entire nation. This will help in removal of the cascading tax effect. Cascading effect refers to tax to be paid on a tax. Under GST, this will no longer happen as the unified tax will bring the entire indirect tax system under one umbrella. Another important benefit is that under GST, the input tax credit can be availed on both goods and services, which eliminates the cascading effect. GST will also unify the returns and compliances as there will no separate VAT and service tax. Read our article to know all the benefits of GST. 5. Who are the taxable persons under GST? Short answer is a person who carries out any business at any place in India and who is registered or required to be registered under the GST Act. Amongst others, GST registration is mandatory for: a. Any business whose turnover in a financial year exceeds Rs 20 lakhs (Rs 10 lakhs for North Eastern and hill states) b. An input service distributor c. An E-commerce operator or aggregator d. A person who supplies via e-commerce aggregator Here is a complete list of taxable persons under GST. 6. What is a GSTIN? GSTIN refers to the unique GST identification number that every business will be allotted. Every taxpayer will be allotted a state-wise, PAN-based 15-digit Goods and Services Taxpayer Identification Number (GSTIN). Also, note that having PAN is mandatory for register under GST. Registering under GST is quite simple and is explained in simple steps in our article. 7. What is Reverse Charge? Usually, when the supplier supplies goods, the tax is levied upon the supplier. In certain cases, the tax is levied upon the buyer of the goods. This is called reverse charge as the chargeability of tax gets reversed. This is not new under GST, as under the previous VAT regime, the reverse charge existed, but only on services. Now, under GST, it will be applicable on goods as well. 8. What happens to mixed supply and composite supply under GST? Under GST, this new concept of mixed supply and composite supply has been introduced. This will cover all supplies made together, whether the supplies are not related or not. This concept is some what similar to the bundled services which were there earlier. Only the concept of mixed supply is entirely new. Let us look at these in detail. Composite supply refers to a supply that comprises of 2 or more goods or services which are bundled and supplied together. Out of these, only one item can be of principal supply, however, these items cannot be supplied separately. Here is where the concept of composite supply comes in. For example, when goods are packed, and transported with insurance, the supply of goods, packing materials, transport and insurance is a composite supply. Insurance, transport cannot be done separately if there are no goods to supply. Thus, the supply of goods is the principal supply. A mixed supply is when 2 or more individual supplies of goods or services are made together with each other by a taxable person, for a single price. Each of these items can be supplied separately and is not dependent on any other. For example, a supply of a package consisting of canned foods, sweets, chocolates, cakes, dry fruits, aerated drink and fruit juices, supplied for a single price is a mixed supply. All can be sold separately. Since aerated drinks have the highest GST rate of 28%, aerated drinks will be treated as principal supply. Read our article on mixed and composite supply to understand better. 9. What is continuous supply? When goods and services are offered or supplied periodically (that is every fortnight or every month, etc. ), and payments are also made periodically, it is called a continuous supply. For example, a telecom and internet provider will provide continuous supply as it is provided for a long time and also the payments are done every month or quarterly. 10. What is a compliance rating? The GST compliance rating is a performance rating that is given to all registered taxpayers. This rating tells you how complaint the supplier will be with respect to GST provisions. This gives an option for the buyer to choose the seller based on the GST compliance rating. The rating system can be devised on a scale of 1 to 10, based on the type of business, with 10 being the highest complaint and 1 being the least complaint. Please note that the actual compliance rating system is yet to be introduced. Supply of goods & services is the taxable event to charge GST. Supply under GST includes sale, disposal, renting & more. Read more on Supply of GST - Scope. GST Number Search by Pan - You can search your GSTIN with the trade name, PAN or legal name of the business or owner. Read the guide to find your GSTIN with the PAN. Get GST helpline number and customer care number with mail IDs. Reach out to government or ClearTax for any queries regarding Goods and Service Tax. E-commerce is a fast-growing industry where sellers have an access to a pan India market. Read on to find out how GST will apply to you if you sell online. Here is a list of GST state code list required by GST registrants. Also know how to check your GST jurisdiction on the CBEC website. Here are simple and easy to understand GST videos from ClearTax. Let us watch these videos to understand GST concepts in detail. www.gst.gov.in login is Official government GST website that provides GST services like Registration for GST login, GST Return filing, announcements, link to GST Acts, rules, and much more. ClearTax gives you here all the Latest Updates on happening on gst gov in login at one place. GST Seva Kendra is a CBIC initiative to guide every GST taxpayer in their GST journey. Get to know about GST Helpline number and helpdesks near you. UQC is simply a unit of measurement. Find out how to use UQC under GST. In this article, get to know about GST Benefits compared to previous VAT system in India. Find out about the advantages of GST & disadvantages of GST in current tax regime. What is the fullform of GST? What is the meaning of GST in simple? What does GST mean in various Indian languages? Click to get the simplest bird eye view. 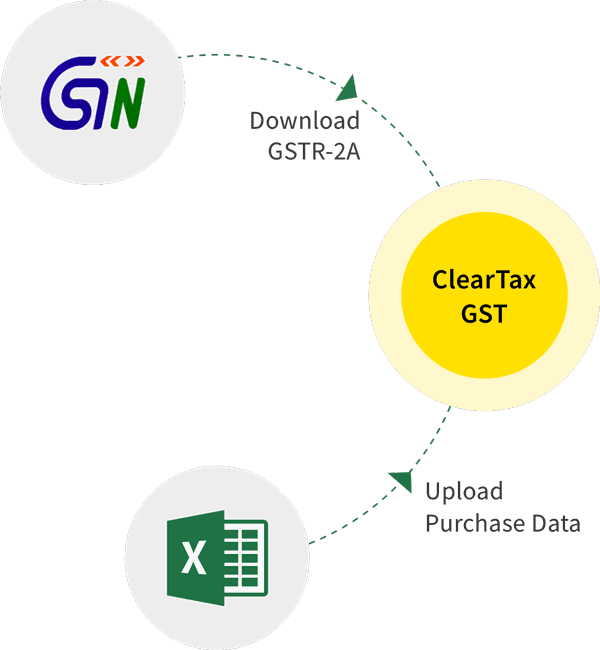 Get your GST queries resolved with ClearTax FAQ Search. You can also ask question to our support team. Find all chapters & sections of GST Act ( Goods & Service Tax Act ) 2016 - 2017 released by CBEC India with an easy search tool developed by ClearTax. Under GST there is reverse charge on buying from unregistered dealers. If such purchases are above Rs. 5,000 then they will be required to pay GST on them. What is GSTN ( Goods and Service Tax Network )? GSTN / Goods and Service Tax Network is a non-profit, non-government organization which manages the entire IT system of the GST portal. July 1st is the ICAI Foundation Day. Here's the history of this prestigious institution and the day celebrated as CA Day. There are some items not covered under GST, i.e., they are beyond the scope of GST. They are listed in Schedule III of the GST Act. ಸರಕುಗಳು ಮತ್ತು ಸೇವಾ ತೆರಿಗೆ ಅಥವಾ ಜಿಎಸ್ಟಿ ಜುಲೈ 1 ರಂದು ಬಿಡುಗಡೆಯಾಗಲಿದೆ, ಮತ್ತು ನಾವು ನಮ್ಮ ತೆರಿಗೆಗಳನ್ನು ಮಾಡುವ ರೀತಿಯಲ್ಲಿ ಕ್ರಾಂತಿಕಾರಿಗೊಳಿಸಬೇಕಾಗಿದೆ. Learn all about GST with Cleartax Free GST ebook. This online GST book explains the basics of GST, comparison with current tax system & more. Certain activities clearly classified as goods or services under GST Schedule II, which aims to remove complexities and reduce legal action. Transactions between related persons and other activities of GST Schedule I will be treated as supply even if made without any consideration. All is not smooth sailing for GST and there are some obvious disadvantages of GST for businesses and end consumer that they need to overcome.